P1: Here begins the strange story of an earthman whose powerful will carried him across 43 million miles of space! P2: The following tale is compiled from John Carter's memoirs written upon his return from Mars. P3: Arizona, 1865 -- Following the Civil War, Captain John Carter and Lieutenant Jim Powell are prospecting for gold -- one afternoon Apache indians attack them. P4: John Carter barely escapes into the foothills with Powell's body before his wounded horse falls dead. P5: Seeking to hide his friend's body, Carter is choked by strong gaseous vapors inside a lonely cavern. P6: He slumps to the ground, paralyzed; then something snaps. "Before me lies my own body!" He whispers. P7: Now in the sky outside, a glittering red planet seems to beckon with a strange, irresistible attraction. P8: Hypnotized by its overpowering fascination, the man stretches his arms toward the flaming planet. In an instant of extreme cold and darkness he is drawn through the trackless immensity of space. P9: John Carter opens his eyes upon a weird landscape. "Could this be Mars?" he mutters, puzzled, "or is it -- death?" 2. 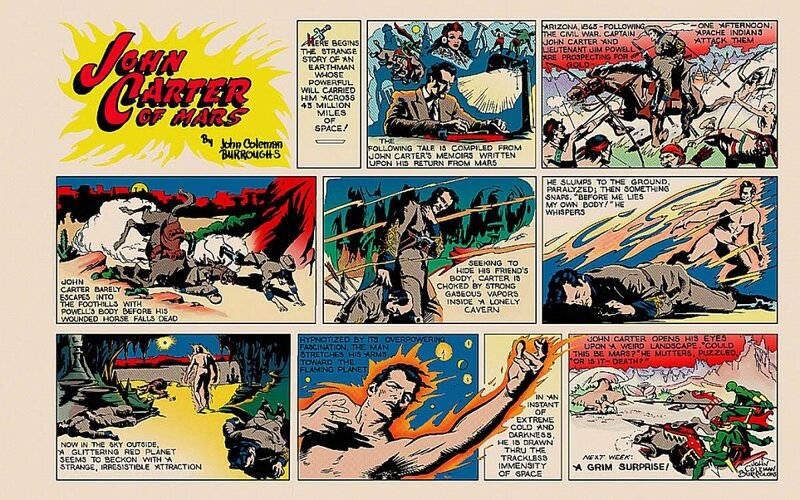 The Carter story, as told in the Sunday strip, passes over Carter's experiments in jumping about on Mars, his discovery of the Martian egg incubator, and his witnessing the hatching of the green children. Instead, the final scene in the Sunday strip duplicates the last panel in issue #30, where Carter is threatened by the mounted green men. The fictional narrator of the novelization of the Sunday strip story can skip over most of the action/events portrayed on Sunday page #1, summarizing Carter's transportation to Mars as an already known "fact." The narrator of the novelization will be Valla Dia, princess of Duhor, a land allied with the Empire of Helium. In a framing sequence for chapter 1, Valla Dia writes a short letter to "Jane" on Earth, and there introduces the Sunday strip story as a personal reminiscence, recently entrusted to her by Dejah Thoris, while on a state visit to Duhor. According to ERB's fictional sequence of events on Mars, Ulysses Paxton, on two or more occasions, traveled to Helium. It can be assumed that his mate, Princess Valla Dia, accompanied him there when he wrote his "letter" of June 8th, 1925, to ERB on Earth. In the Introduction to Master Mind of Mars, ERB has the fictional Paxton say: "with the aid of one greater than either of us, I have found the means to transmit to you with this letter (the manuscript)..." Presumably John Carter, in one way or another, sent the letter and manuscript to his "nephew" on Earth. 3. For the seventh tale in the Mars series, A Fighting Man of Mars, ERB uses the literary device of having Jason Gridley communicate with Ulysses Paxton. from Earth to Mars, via the Gridley Wave radio, in order to procure the story "re-told" by ERB in 1930: "It was from Ulysses Paxton, one time captain, -- the U.S. Infantry, who, miraculously transported from a battlefield in France to the bosom of the great Red Planet, had become the right hand man of Ras Thavas, the mastermind of Mars, and later the husband of Valla Dia, daughter of Kor San, Jeddak of Duhor.... the best minds of Helium had settled down to the task of analyzing and reproducing the Gridley Wave. " -- ERB uses a similar framing scenario in the ninth tale in the Mars series, Synthetic Men of Mars. There Carter tries to find Ras Thavas, to heal Dejah Thoris' injury. He travels with an assistant to Duhor to enlist the help of Vad Varo in Duhor, The story narrated by Vor Daj and sent as an English text to Jason Gridley by Ulysses Paxton in late 1938. Although no such framing decice is used for the next story after Synthetic Men, which was the "Giant of Mars," written by JCB, it can be postulated that Paxton also relayed that narrative to Earth. Thus, the point in time for the similar relaying of the Sunday strip story, will be shortly after "Giant of Mars" was written in late 1940. 4. The "letter" and novelization "manuscript" will be sent from the city of Duhor. This royal capital of a remote red Martian state is located 10,500 haads northeast of Helium (not northwest, as mistakenly published). Vor Daj underestimates the distance... ("Duhor, which lies some ten thousand five hundred haads, or about four thousand earth miles, northwest [sic] of the Twin Cities of Helium.") The distance and direction match a point 25 degrees N. of the equator, in the NW quadrant of Barsoom. Vad Varo is a Jed there, under Jeddak Kor San, father of Princess Valla Dia. Duhor is 5,000 haads west of Amhor and 7,800 haads from Toonol. The snow clad Artolian Hills surround Duhor and separate it from Toonol. The John Carter Sunday series could be presented as a "Mega-Little Book"
with a format similar to the one used by the old "Big Little Books." printed on the facing left hand page. A sample of the first five chapters of text is presented here. the entire series of the Sunday pages. Your reply reached us a few weeks ago but I have delayed responding until I could gather together a number of things which will be helpful in relating the account of how Dejah Thoris, the Princess of Helium, first met Captain John Carter, the traveler across space from your world. I hope you will forgive me for making you wait so long for this story, but I feel that the additional information I have collected has made the delay well worthwhile. We were amazed and delighted to hear that the compilations of events here on Barsoom which we have relayed to you by this strange interplanetary wireless system have received such a wide readership on Jasoom. We understand why the stories must be retold there as if they are fiction; although, to be truthful, Captain Paxton is yet a little chagrined, to think that his personal adventures are sold back on the world of his birth as a romance novel! As for myself, I still recall our harrowing experiences at Morbus with much romantic feeling and I am happy to have assisted Ulysses in his telling of that story, as well as with the subsequent accounts we have relayed to you through the technical marvel Mr. Gridley has invented. It was not too long after her remarkable recovery from the critical injuries that she suffered in the flyer mishap that Her Majesty stopped over in Duhor, while Captain Carter was paying a memorial visit to Okar, where he is yet honored as the Warlord of Mars. She tarried as a guest in my father's palace for five days and during that private visit we passed much of the time discussing what has transpired on Barsoom in the years since our Earthmen arrived here so suddenly and mysteriously. The Princess and I share a special bond in that regard and I am greatly honored that Captain Carter continues to call Jed Vad Varo (my Ulysses Paxton) his dearest friend. But that's enough about my romantic feelings! I shall tell you the story that Her Majesty recounted to me now, just as she gave it while at Duhor, interspersed with additional insights furnished by my husband and by Jedwar Kantos Kan, following his recent interviews with the daughter of the Jeddak of Thark. I give all this to you as honest history and you may decide for yourself whether or not you can give credence to the more fantastic portions of the story. Here begins the strange tale of Captain John Cater, an Earthman whose powerful will carried him across the vast stretches of trackless space to the planet Mars. It is also the story of a princess of Mars, the royal maiden Dejah Thoris of Helium, who became his companion in a great adventure -- an adventure which even they recall as being almost beyond belief. During the time on Earth when nations such as the United States of America were yet in the hot air balloon stage of exploring the cloudy heavens, the ancient civilization of Mars had for ages sent great vessels into the thin cold air of that dying planet. It was onto just such a giant ship that Talak Xor, Master of the Imperial Academy of Helium welcomed a party of officials and scientists atop the Royal Airdrome one fateful day. Your Majesty! We are honored by your presence on board the Haldar during the initial stages of our expedition beyond Polodona. Every possible preparation has been made for your comfort and four battleships will stand in readiness to return Your Majesty to Helium the very moment your royal person is pleased to leave us!" "I require no special treatment, Master Professor. I am accompanied by a single servant and both of us will perform our share of the work on board. I trust that the naval officers of my grandfather's empire will protect us all. And I shall not leave your expedition until its flight path again takes us near Greater Helium." Then the young woman added, "You and the admiral are in command -- I shall not interfer with your duties of leadership. Now, if you'll please point out the way to my cabin, I believe your expedition's ships are about ready to depart." Not many days before this, in the opposite hemisphere of the red planet, the extraordinary arrival of Captain John Carter, late of the Army of Northern Virginia, transpired -- unanticipated and unwitnessed by any denizen of Barsoom (as Mars is called in the language spoken there). The account of Captain Carter being attacked while prospecting for gold in Arizona, his subsequent escape into a weird cavern and his uncanny transport to Mars has been told so many times that must already be known to the reader. It is only necessary to mention here, that well before his suffering the remarkable effects of the strong gaseous vapors inside the lonely Arizona cavern, John Carter had frequently gazed in wonder upon the red planet in the nighttime sky. For more years than he could remember the glittering point of light seemed to beckon him with a strange, irresistible attraction. He felt that the powers governing that far off world must also he guiding his own fate, and that one day the mystery of his overpowering fascination with Mars must surely be revealed to him. The revelation came in a way he could never have anticipated, there in the stillness of the Arizona nightfall. But when the unexpected transition came he realized that he had no hope or desire to challenge ethereal destiny. The man stretched his arms toward the flaming planet, and in an instant of extreme cold and darkness he was drawn through the immensity of space to a new beginning -- a new life in the world beyond earthly existence. The paralyzing chill melted slowly away. His feelings of weightless were replaced by the gentle tug of alien gravity. John Carter opened his eyes upon a weird landscape. In the sky above a shrunken, sober sun cast its rays through an atmosphere the color of an eternal dawn. Stars twinkled here and there which are never visible during daylight hours on Earth. "This can't be Earth," the Virginia Captain murmered, as he rose up from a soft yellowish bed of spongy vegetation. He was dazed and knelt unsteady on the unfamiliar ground. John Carter was naked, unarmed and evidently alone in a strange new world. The mosslike vegetation stretched around him in all directions -- unbroken, save for some slight outcroppings of rock and a few diminutive clumps of unknown plants -- for as far as his eyes could see. "Could this be Mars?" he wondered silently. And then, aloud, he continued his question: "or is it -- death?"